Kabul hotel attack death toll includes one American. 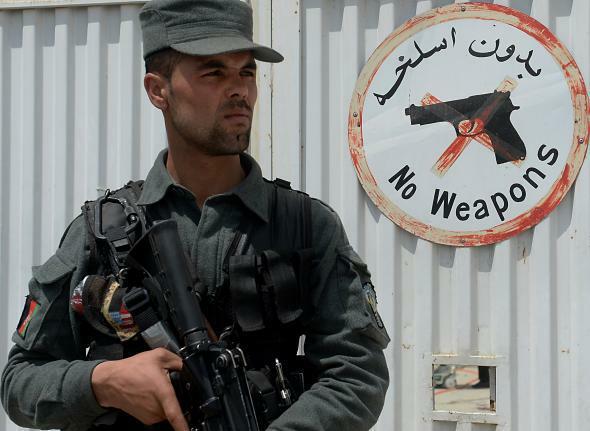 An Afghan policeman keeps watch at the gate of the Cure hospital in Kabul on April 24, 2014. Gunmen attacked a central Kabul hotel on Wednesday evening (local time) reportedly killing five people, including one American. Several armed men entered the Park Palace hotel, a popular destination for both Afghans and foreigners, according to local officials. There was no immediate claim of responsibility for the attack, although the Wall Street Journal notes the Taliban targeted the luxury Serena Hotel last year during a spike in violence aimed at foreigners in the capital.